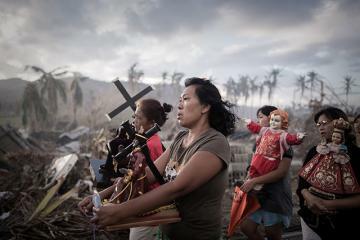 Few days ago, I published on my Facebook a picture of some survivors holding the statue of Jesus in the midst of the storm that struck Samar and Leyte. On that picture, I wrote the following sentence, “carry on keeping faith even in storm.” Few minutes later, I received a strong reaction from someone affirming that it is because of those statues that they are punished. According to him, it is written in the Bible that we cannot make any image of God. In this paper, I want to make a short reflexion concerning the Yolanda typhoon, particularly the natural disaster in Samar and Leyte. Firstly, let us imagine a student who just left happily all his family in Samar or Leyte after his semester break and comes to Manila. Few hours after his arrival in Manila, he hears about the calamity and unfortunately, all his family passed away. I am sure that at first glance anyone would think about misfortune. Some can even ask, “why not me? Why them?” why only bad things happen to me? I am doing my best to do everything according to Lord’s commandments so why these happen to me? And the conclusion of our thought can be one of the following: God does not love me; there is no God because no God can accept such things; God is punishing me, and so on. Actually, I think that it is a normal way of thinking for every human being in front of these situations. Having lost a family is not the same as having lost a million pesos. In fact, we can gain money back but never someone who pass away and worst of all, our family members. Nevertheless, I think that our thought and our way of perceiving God should not remain at that level. On the other side, when my parents gave me birth, they never wanted me to suffer; rather, they did their best to make me feel that they love me and are struggling to provide a better future for me. In connection with this affirmation, when God creates us, he never wants to see us suffering, mourning or crying, but happy. Who, therefore, is that god who wants to see us suffer, who created us to always mourn and cry? If God knows everything, should he not know that we are weak and due to sin? If God deal with us according to our sins, who would be save? To these entire questions, no one can say that he is in good relationship with God because he is worthy. All of us are children of God not because we have deserved it, but because He first loves us and plunges us in the ocean of his mercy whenever we sin. We should not therefore understand God as a judge who is only there to wait when we commit mistakes and he punishes us. He is first and foremost a God of love. He created us with love and deal with us through his love. Consequently, it is a mistake to see in the calamities of Samar and Leyte a punishment from God. Instead of running away from our responsibilities, and putting everything on God’s shoulders, let us be more and more mindful of how we use our world. Someone can even argue to what I have said that, “if God is love and merciful, why doesn’t he help us?” I will clearly say that God is always helping us and even helping those in Samar and Leyte. As a simple example, many people in the Philippines made donations to help the victims. In my community for instance, we quitted some important activities in order to help our brothers and sisters there. Even at the international level, many countries became involved in raising fund to assist them. Many people also travelled to Samar and Leyte to help the victims. I can see God’s Hand in these actions. Even in our sufferings, God always comforts us through others. The problem is that when we have dark days, we tend to forget that sun ever shone. St John of the Cross noticed it when he said, “when there is consolation we feel it will last forever; and when there is desolation we believe God is gone forever.” Even the Great Saint John the Baptist who before proclaim Jesus as a lamb of God, sent his disciples to ask Jesus if He was really the one to comes when he was in a weak position. I, therefore, believe that God knows our feelings, but invites us not to remain endlessly mourning our injuries, but open ourselves to hope. To conclude, I can say that after a year and a half in the Philippines, I have discovered that Filipinos possess the gift of hope, which is always within them. I first of all want to give thanks to the Lord who has granted it to you. Secondly, I share with you one way that I use and helps me keep on hoping: I have a journal in which I always write important things that happen to me, so that when I am in crisis, I read that note book and it helps me to have an over view of God. And those who think that God is upset because of images, it would encourage them to read and study the whole Bible and acquire a broad and comprehensive view of God and avoid getting stuck with few verses only. Let the baby Jesus who is to come give us more strength to keep hoping against all hope. Green Thomas, A vacation with the Lord, London, 1896, p.25. Well done, without the gift of resilience we cannot stand. This is a special gift granted to Filipino people by God. It is a human tendency to get to forget God when things go wrong rather than becoming mature in our faith. “The problem is that when we have dark days, we tend to forget that sun ever shone.” It is a reality that takes aback most of people around the world. The ideal should be “to look for refuge in the Lord.” Indeed, Filipinos have reached a higher level in hoping and letting God be the first person whom they call up whenever they are in trouble. As St. Peter upon water, they feel saved accordingly. Thank you Saa for this insight you express here! Further, Keep moving on.